St. Bart’s is arid, with volcanic rock of just eight square miles, and is home to fabulous beaches, luxury yachts, designer duty-free boutiques, and celebrities. Its natural beauty is like no other. One of the best things about St. Bart’s is the quality and variety of the food. Dining compares favorably to almost anywhere in the world. Varied and exquisite cuisine, a French flair in the décor, sensational wine, and attentive service make for a wonderful epicurean experience in almost any of the more than 80 restaurants. L’Esprit offers tasty and innovative dishes to a romantic terrace close to Saline Beach. The menu has lots of variety, from light French dishes with a Provencale twist to interesting salads, pastas, burgers, and steak. Don't miss the crab cakes… a St. Bart’s tradition. Enjoy a peaceful sunset at the Café Santa Fe, perched atop a high peak with a stunning panorama view of the island. Check out the scene at the legendary Nikki beach club, where the champagne flows freely during Sunday's Tahiti Party. Reservations are highly recommended. St. Bart’s is a duty-free port. Discover the elegant displays and marble floors reminiscent of Rue du Faubourg St. Honoré in Paris. Don’t miss shopping for high-end designer items and one-of-a-kind finds at Calypso in the capital of Gustavia. The shopping diva will find many well-known labels in Gustavia, including Cartier, Lacoste, Hermès, Patek Phillippe, Chanel. St-Jean also offers shopping options. St. Bart’s is home to beautiful, tranquil beaches. As such, this part of the Caribbean is highly sought after by Hollywood royalty. Play with the rich and famous on Baie de St. John, a beach ringed with the island’s top hotels and clubs. The Yacht Club hosts some of the most spectacular yachts in the world. Paul Allen, co-founder of Microsoft, spends much of his time on the island. His yacht, Octopus, is moored there during the winter months, and is known as one of the largest yachts in the world. Pick up snorkeling gear and head to secluded Gouverneur Beach, where you’ll spot angelfish, sergeant majors, sea turtles, and the occasional nurse shark. Plongée Caraïbe is recommended for its up-to-the-minute equipment and dive boat. They also run two-hour group snorkeling trips on the Blue Cat Catamaran. Go "six feet under" (the surface of the sea) for a close-up view of St. Barth's coral reefs through large glass portholes of the Yellow Submarine. An excellent adventure for families. Try your hand at deep-sea fishing. Most fishing is done in the waters north of Lorient, Flamands, and Corossol. Popular catches are tuna, marlin, wahoo, and barracuda. There's an annual St. Bart’sh Open Fishing Tournament, organized by Océan Must, in mid-July. 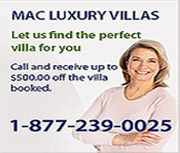 MAC Caribbean Villas can help find your ideal villa. With over 25 villas on the island to chose from, MAC Caribbean can help connect you with the villa that fits your personality, lifestyle, group size, and budget. These beautifully appointed villas all come with private pools, personal space, and a little piece of Heaven. Getting married? Need a corporate retreat? There are villas for that too!